I’ve got a lot to be thankful for this Thanksgiving, including family around the table, and a pleasantly warm holiday weekend - especially given the snow that’s fallen in Kansas City a few times already this year! 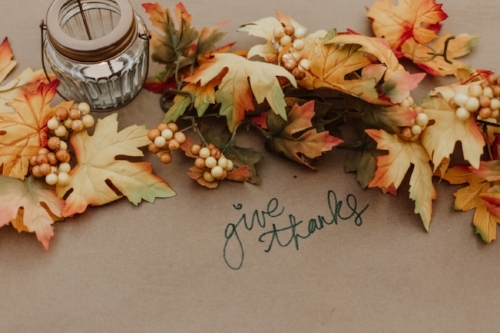 We should strive to live a life of gratefulness all year around, but I love how Thanksgiving encourages us to pause and thank God for what he’s blessed us with. Here are just some of the things that I’m incredibly thankful for this year! What are you thankful for? Let me know in the comments! Joseph and I have been married for almost two years, and our marriage has been everything I’ve prayed for and more. I love him more today than I did on our wedding day, and daily pray for the grace to love him more tomorrow than I did today. This time last year, Joseph and I were in the middle of our infertility journey. I remember wishing that three Christmas stockings would be on our mantle that year, but instead God asked us to abide with him and parent our little saint in Heaven. This year, I’m almost halfway through our second pregnancy and everything is looking great! We get to see our littlest baby soon at an upcoming appointment. It’s been such a blessing to get to know this baby and spend so much time with him or her over the last months. Please continue to keep us in your prayers! We spent the past week moving for the third time in less than three years of marriage! I promise it’s not because I love packing or because we’re bad renters. But every time we move into a new place, it takes a while to start feeling like home. We’re starting to get our furniture arranged where we wanted and it’s starting to look like our home. What I’m most excited for with this new house that we’re renting is a huge living room and dining room so that we can host dinner parties and brunches with friends and family and everyone can see each other. We’re trying it out this weekend with a family Thanksgiving, and I can’t wait to see how it goes!